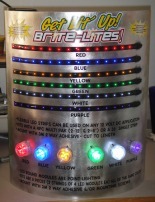 Attention Dealers and Distributors of Brite Lites LED Accent Lites!! Bluhm Enterprises has created a versitle counter display to help show our flexible LED strips and round Accent LED modules. Each display is on a curved aluminium panel 16" x 16" and has 6 12" LED strips and 6 round LED modules, all wired together and complete with a 12 volt power transformer for standard 110v. wall power. 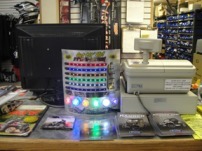 This light kit is available to dealers to purchase for $129.99. The kit is also available as part of a promo buy-in package where the display can be shipped with your order for no charge. The kit comes as pictured, completely assemboled and includes the power transformer, so you just set on the counter and plug in. To order, call for more details.